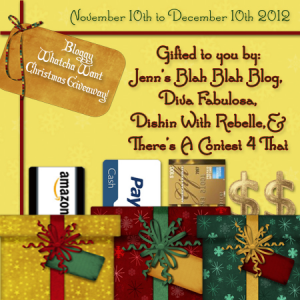 Jenns Blah Blah Blog, Divafabulosa, Dishin with rebelle, and There's a contest for that will be bringing the bloggy whatcha want Giveaway!!! You can sign up right here on Jenns Blah Blah Blog. Hurry up before all spots are taken! !